Acitelli on History: The Sale of Pete's Brewing Co.
Pete’s Wicked Ale was a brown ale that namesake and co-founder Pete Slosberg stumbled upon while trying to clone Samuel Smith’s Nut Brown Ale. Photo via a 1994 TV ad for Pete’s Brewing Co. In early 1998, Pete’s Brewing Co., one of the most successful small-scale brewing operations in the United States, went looking for smaller fry to acquire. Then its investment bank, Morgan Stanley, called to say that a bigger fish was looking to gobble Pete’s. That bigger fish was Gambrinus, the San Antonio-based firm best-known then as the importer of Corona and already the owner of the BridgePort Brewery of Portland, OR, and Texas’ Spoetzl Brewery of Shiner Bock fame. An affiliate of Gambrinus offered Pete’s $69 million in cash, or $6.375 a share at a time when Pete’s shares were trading at around $5.80 each. The deal closed 16 years ago this month. It’s a milestone to keep in mind as more larger breweries acquire their smaller counterparts, such as Anheuser-Busch InBev’s February takeover of Blue Point on Long Island and Duvel Moortgat’s purchase of Kansas City-based Boulevard Brewing a few months before. That is because Gambrinus’ acquisition of Pete’s was particularly auspicious. Pete’s various offerings were some of the best-selling smaller-batch beers ever in the U.S., especially its Wicked Ale, a brown ale that namesake and co-founder Pete Slosberg stumbled upon while trying to clone Samuel Smith’s Nut Brown Ale. Pete’s, along with rival Boston Beer Co., makers of Samuel Adams, accounted for more than one-third of all “craft” beer produced domestically by the early 1990s; they were the gateway brews for such beers at a time when that segment of the brewing industry was growing exponentially. Pete’s Pub Ale was one of my favorites when I was in my early 20’s…I wonder if I would feel the same 15 years later..there are so many good micro brews around that I’m not sure how it would stack up…guess we will never know …cheers! Lets not forget Pete’s Summer Brew, it may have been one of the best ever! A tasteful, delight which spawned many in attempt to copy. I was saddened to see there departure! The first legal keg of beer I purchased was Pete’s Wicked Ale. It was June 13 1994. Martinettis in Allston MA was the store. Thank you Pete!! original style,,. og, i graduated in hgh school 94 when we started drinking our generation apprecitiates flavor…. 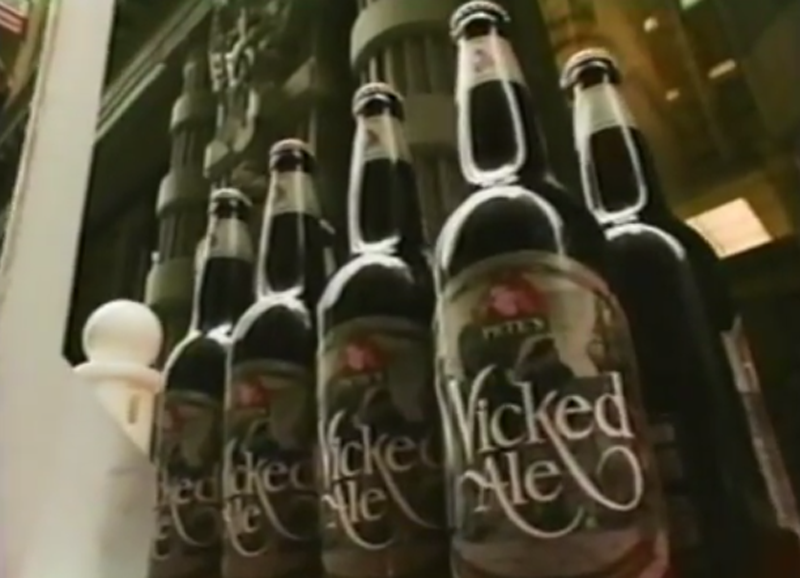 Pete’s Wicked Ale was the first beer that made me aware of American craft beer after I came US in the late 1999 (and the second was Sam Adams Double Bock). However, when Gambrinus changed the taste of Wicked Ale in 2001, I stopped buying it. Pete’s Wicked Ale was a fantastic beer! I completely agree with you about it going downhill sometime after Gambrinus got involved. That’s when I left. I was one of the Sales Managers for Pete’s Brewing Company back in the day. That original recipe for the Wicked Brown was excellent and unique, the brown ale counterpart to Sierra Nevada Pale Ale. As for that beer, homage to hallowed English models allowed something new to emerge. Wellington Brewery in Ontario makes a strong brown ale that reminds me of that beer but it is higher in abv and really isn’t the same. Would be grateful for suggestions on current products which resemble the original Petes Wicked Ale. Petes Wicked Strawberry Blond is my all time FAV!! I loved the maple porter. I have been trying to clone it for years and can’t get there. I have a batch that’s hopeful now 7 days till the test. He’s a master brewer I liked just about every beer they put out but wicked ale was a must have in my fridge for years. Thanks for some of the fantastic brews. I worked for the same company that Pete did when he created the Wicked Ale, and he used to supply it for our company beer busts. It was surprising that he didn’t leave the company until well after the beer became a big seller. It was the reason I love craft beer.